A NanaWall operable glass wall enables the hotelier to create large inviting entrances in the lobby area and throughout the hotel, ensuring a memorable first and lasting impression. Incorporate beautiful views, hotel landscaping, natural daylight and fresh air into the registration, dining, and guest room areas. NanaWall operable glass walls used as interior divisions in hotels and restaurants allow personnel to quickly and easily incorporate or close retail space, dining areas, bars, and meeting rooms while still maintaining the feeling of wide-open space that only a glass wall can provide. Let in the sunlight and incorporate beautiful views with a moveable glass wall system. NanaWall operable glass walls empower hoteliers to craft unforgettable guest experiences. Our customizable solutions extend guest areas to the outdoors, providing a seamless transition between an indoor environment and a breathtaking view. NanaWall sliding glass wall systems bring value to hotels by providing a unique guest experience. 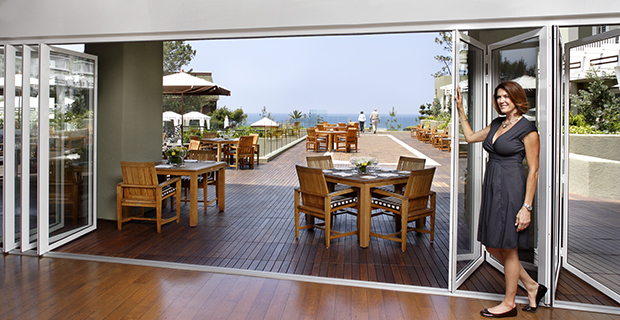 Customized sliding doors allow for seamless transitions between the building interior and exterior. 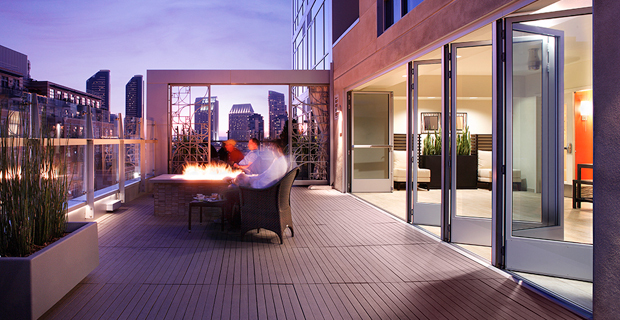 Hoteliers can extend their restaurant, bar or lounge areas to an outdoor patio, balcony or terrace. When closed, NanaWall exterior sliding glass doors maintain a comfortable indoor environment, dampening sounds and keeping out the elements. Even in extreme weather conditions, NanaWall products offer world-class performance. These benefits make NanaWall movable glass wall solutions ideal for a number of hotel use cases. 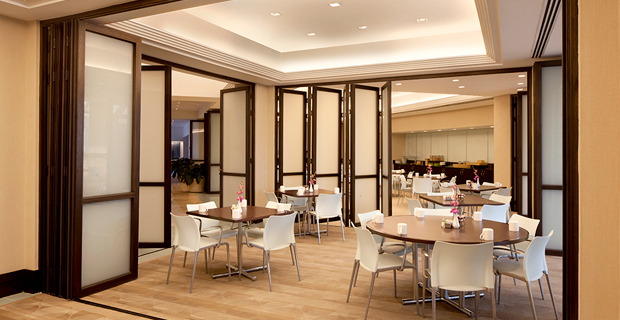 Opening glass walls enable hoteliers to create inviting lobby areas, utilize natural daylight and let in the fresh air. Plus, interior glass walls are perfect partitions for private functions such as receptions, dining, gaming and business meetings. All of our movable glass wall solutions are completely customizable, based on your needs and desires. NanaWall offers proprietary specifications for corporate branding, and our clients benefit from reduced costs on signature colors, logos and hardware styles. NanaWall products are independently tested for air, water, forced entry, impact and thermal performance. Our multi-point locking system meets or exceeds most forced-entry testing for commercial grade doors. Plus, built-in adjustment and compensation points ensure continued use if building settling occurs. NanaWall will always be your main point of contact for all your service needs. Our dedicated architectural support team is there to evaluate your system and provide design guidance as needed. To see how some of the world's top hotel brands leveraged NanaWall solutions to create impeccable guest experiences, check out the use cases below. 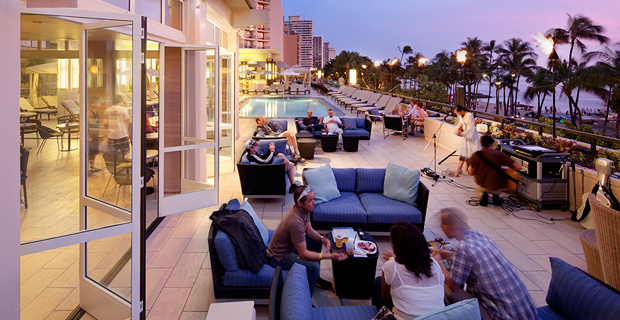 To create a unique and memorable guest experience, Hotel Indigo opens its roof deck to outstanding views at this San Diego CA location with a NanaWall SL70 system. During its recent multi-million-dollar renovation, the Hyatt Regency Pier Sixty-Six added an aesthetic, flexible solution to dividing and closing off its restaurant area. A unique and memorable guest experience was created by opening up this lobby of Hyatt Regency Waikiki with NanaWall SL45 systems to the gorgeous environment beyond. L’Auberge guests can relax on the expansive deck, eat in two different restaurants, or stroll down a private path to the beach. “Relaxing by day and spirited by night” is the owners’ mantra, and the amenities and atmosphere support this philosophy. 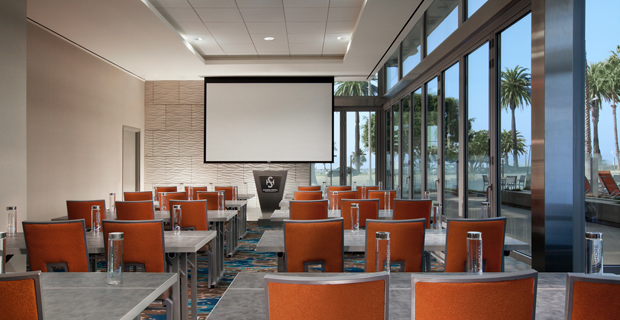 At Shore Hotel in San Diego CA, the meeting room itself is multifunctional: during the day it hosts meeting functions and, come evening time, is transformed into a lounge.